In a tough economy, brides are looking for ways to save a buck (or hundreds of bucks) on their wedding gowns. Many are turning to thrift stores, consignment shops and other locations where you can buy gently used, pre-owned gowns. For something a little upscale, Encore Bridal is a hot choice. They offer new sample couture gowns and pre-owned recycled couture gowns for up to 60% off. What do you think about wearing a pre-owned dress? Is it worth the money you’ll save or do you want to stick to something brand new? Pictured here is a Vera Wang bridal gown, originally priced at $3,999. You can get this used gown for $1,750 at Bravo Bride. Alfred Angelo is celebrating their 75th Anniversary with two fabulous ways for you to win – the Wedding Dress Diva contest and 75 Days of Prizes giveaways. Both contests are running now and run through March 28, 2009. Are you looking for wedding favors for your 2009 wedding? Hop over to Truly Wedding Favors, where you can find an assortment of unique wedding favors at affordable prices. According to the annual “What’s on Brides’ Minds” survey, conducted by Infosurv, Inc. for David’s Bridal, 75% of brides-to-be admit that they will have to make adjustments to their wedding budget as a result of the economic climate. About one quarter plan to cut their budget in half and one in ten said their budget had dropped more than 75%. Over half (53%) of respondents do not plan to spend more than $25,000 on their big day, while a little over one third (34%) said they plan to spend $10,000 or less. As a sign of the times, aside from their wedding, paying off debts (77%) was noted as couples’ top economic priority. In these challenging economic times, brides should create a spending plan to identify where they want to splurge and where they feel they can spend more cautiously. The survey revealed that the first area that brides-to-be would be willing to adjust is the number of guests (45%), followed by the wedding cuisine (45%). When asked what items they refuse to compromise on, the top responses were wedding bands (45%) and, not surprisingly, their wedding dress (37%). While the perfect wedding dress may be where future brides are willing to put their money, if there is less of it, spending wisely is key. Fifty-five percent of brides surveyed said they plan to spend no more than $600 on the bridal gown of their dreams. To stay within budget, it’s a good idea to shop at a bridal store that offers wedding attire and accessories for the bride and entire bridal party to save both time and money. Brides-to-be should also look for bridal stores that offer discounts on additional products and services, including financing options, layaway programs or proprietary credit cards that have same as cash terms. This year’s survey revealed that many future brides have a “green” side and are concerned with preserving the environment. While 45% of those surveyed said they are making an effort to be environmentally conscious, many do not realize that eco-friendly practices are also great ways to save cash. Brides can plan an earth-friendly wedding and help keep costs down for friends and family by selecting bridesmaid dresses that can actually be worn again (re-use is a cornerstone of going green) –whether for another function or with ballerina flats and a cardigan for a date night– or encourage their bridesmaids to choose a flattering dress in the wedding color scheme. Almost two-thirds of respondents (59%) said they were planning on one of these options, to ensure that bridesmaids are happy with –and reuse– their dresses. For wedding invitations, if a bride-to-be wants a traditional style to mail, she may want to look for green options, including those made of 100% recycled paper or natural cotton fibers filled with wildflower seeds. Buying a wedding dress is a big decision, and with limited funds brides-to-be need to make the smartest choice. The key is to find a gown that fits the budget and the bride’s style preference. Brides should look for a bridal retailer that offers gowns that are fashion-forward and affordable because they can have both. Beyond the dress, it’s important for brides to create their own unique style for their big day, which is easy with the right bridal accessories. From colorful sashes to distinctive crystal brooches and delicate veils, brides have an array of options from which to choose when tailoring their look to complement their personal style. A beautiful piece of family jewelry can also be passed down through the generations as a meaningful heirloom. With the declining economy, an added concern has recently surfaced among the newly engaged – trusting that a bridal shop and designer they choose will be able to deliver. Nearly half of brides surveyed (46%) are concerned that their bridal boutique may go out of business. In light of this, brides should choose a reputable partner that has a solid record. When smaller bridal shops close their doors due to the economy, they often leave brides stranded without their deposit or gown – a significant blow to a wedding budget. To further ease concerns, brides may want to choose a bridal store that allows you to try on a dress in their size and take it home the same day. When it comes to selecting “The One,” while friends and family tend to most frequently dish wedding advice, brides should not forget to take advantage of the resources at the store where they purchase their gown. Bridal consultants are a great source of information, providing knowledgeable insight into the quality, fit and design of all gowns. They are also most familiar with the inventory and may suggest a gown that a bride may not have considered. The Internet can serve as a very useful tool for wedding planning, so couples should compare costs and look for sales in this tough economy. There are several online bridal retailers that offer valuable services to help brides create a seamless wedding day, so couples should do their homework ahead of time. The web also makes it a cinch to get the opinions of loved ones. Surprisingly, only 23% of brides-to-be reported using social networking sites to poll their friends and family about wedding day elements, but as expected, sites like MySpace and Facebook were the most popular. David’s Bridal, the brand that nearly a third of the nation’s brides trust to dress their weddings, is a smart choice is today’s challenging economic times. With a wide selection of elegant bridal gowns ranging in price from $299 to $1,200 –including designer gowns from Oleg Cassini and Galina Signature– David’s offers the utmost in style, fit and craftsmanship at an amazing value. For bridal parties, with 95 color schemes and countless figure-flattering styles to choose from, David’s offers an array of affordable options that brides will love and bridesmaids will love wearing. They also offer budget-friendly, coordinating accessories, including dyeable shoes, handbags, headpieces, jewelry and wedding invitations, allowing brides to design their entire wedding day theme in one stop. As the icing on the cake, DavidsBridal.com offers more than 4,000 exclusive wedding-related products and services, as well as the beautiful, yet affordable db Online bridal gown collection (starting at $99, sizes 2-26W). Not only does David’s offer an unparalleled selection of bridal attire, accessories, gifts, favors and resources –both in store and online– but they are renowned for providing tremendous value and dependable service to brides-to-be across the country. With more than fifty years of experience and 300 locations nationwide, David’s Bridal is a resource brides can trust, which during these times, is certainly an important consideration. While planning a wedding in today’s economy can be challenging, a little research and smart shopping goes a long way. Brides should try not to get too caught up in the planning process and remember that a wedding is a joyous occasion to celebrate. When it comes down to it, no matter what the budget, once a bride has met her match, she’s already rich in love! Here at Truly Wedding, we give you one more tip – pick economical yet beautiful choices on your wedding favors. Truly Wedding Favors offers an amazing collection of high quality wedding favors with many below $2.00 each and some under a dollar. Be smart with your choices but don’t sacrifice quality. Okay okay, you might have noticed posts have been a bit slow around here lately. Well there’s a good reason (and we hope you agree). We’ve been hard at work building and promoting a new web site: redtagcrazy.com. You might be thinking, “What does this have to do with a wedding blog?”, and the answer is, not much. But, if you’re in the process of planning your wedding, chances are you’re a female, and if you enjoy designer fashion as much as we do, chances are you’ll love saving 50-80% on all of it at redtagcrazy.com. Check it out and get $5 to spend! Right now, and for a limited time, click through this blog post and receive $5 to spend on anything you want. Find a hot pair of denim from Rich & Skinny, Paige, Aristocrat, or Lucky Brand, then a hot pair of boots from BCBG MAXAZRIA. Create the perfect outfit for your reception dinner, or honeymoon nights. Have a friend you think might enjoy redtagcrazy.com? Tell them about it, give them $5 with our special promotion, and get $5 when they buy their first item. Find more information at redtagcrazy.com/cash. RedTagCrazy.com is the first “One Deal at a Time” (ODAT) shopping site for women who enjoy high-end fashion apparel and accessories. The ODAT model brings consumers into a unique and exciting shopping experience while creating buzz for and protecting the value of top fashion brands. Each item is offered with limited quantities for a very limited amount of time at 50-80% off retail prices. Unlimited returns, instant alerts and customer satisfaction are guaranteed. RedTagCrazy.com is a Truly Networks, Inc. company headquartered in San Diego, California. For more information, visit www.redtagcrazy.com. It’s always a question whether the couple should have a cash or open bar. With the rising costs of planning a wedding, many consider having a cash bar where the wedding guests pay for their own drinks. I’m here to say – DON’T DO IT. A cash bar at a wedding is ultimately tacky. It’s not a BYOB backyard barbecue. So please, don’t ask your guests to pay for their drinks. They are just that … guests, and should be treated with a delicious meal and beverages. However, just because you are paying for the drinks doesn’t mean the costs have to get out of hand. There are a variety of ways you can cut back. If you opt to have a completely open bar, that means your guests will be able to order whatever they want and you’ll pick up the entire bar tab. Though it sounds expensive, you can reduce costs by creating a limited bar instead. The easiest way to do this is to stock only house liquors instead of premium brands. Also, have a limited number of domestic beers and wines only. Work with your caterer to find tasty options that aren’t overly expensive. One of the hottest trends at wedding receptions is the signature cocktail. With the signature cocktail, you select one or two drinks (oftentimes his and her favorites) and serve ONLY those cocktails at the reception. Though this sounds very trendy and hip – it’s also a great way to cut down on bar costs. You can select favorite drinks of the bride and groom or stick to more traditional options such as Screwdrivers, Margaritas or Daiquiris. Another idea is to pick a themed drink. For example, at a beach wedding you might serve Blue Hawaiians. For a city wedding, you may choose Cosmopolitans. The key to saving money is to communicate with your reception site or caterer. Perhaps the site will allow you to bring in liquor from outside. If that’s the case, you can work with local liquor markets or wholesalers in the area to try to find a deal. When they find out you are getting married, they might give you a newlywed special. Don’t be pressured into the completely open bar with unlimited premium liquor and champagne flowing all night. Your wedding day shouldn’t put you into debt. On the other hand, if you are really short of money, don’t give in and have a cash bar. Instead find other ways to cut back, such as reducing the guest list, eliminating the seafood from your menu or having a dessert-only reception. There are plenty of ways you can save. Name brand fashions for 50-80% retail in a fun-interactive environment – Don’t miss out on RedTagCrazy! There are a lot of marriage proposals on YouTube. Here is a really cute one. What do you think? What’s worse than getting drunk and acting obnoxious at a wedding? Getting drunk and acting obnoxious at your own wedding! This bridal gown is just one of the beautiful choices available from Raylia Designs. They offer a collection of wonderful wedding dresses at affordable prices. This dress (style W875IL) features a combination of soft tulle, lace and taffeta in ivory and cream. You can select from a variety of color combinations. Check out this and other bridal gowns at Raylia Designs. These aren’t your ordinary “green” wedding gowns. The Gwendolyn Gleason Couture Spring 2009 collection features gowns created with certified sustainable fabrics that are organic, but they are very chic and beautiful too. Check out the video for more information and to have a peek at the bridal gowns. Talk about gorgeous. Check out this strapless bridal gown with its beautiful full princess tulle skirt. This wedding gown is from the Sincerity Bridal. 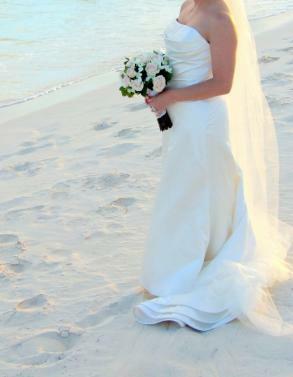 To learn more about this gown (style 3513) and find out where to shop, visit SincerityBridal.com.